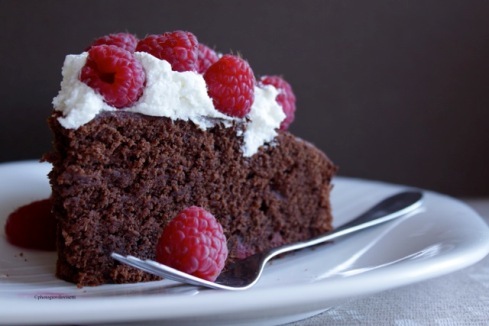 This delicious dark chocolate cake flavored with Barolo Chinato and served with whipped cream and raspberries is a truly romantic treat for an amorous occasion. Chocolate, the so called natural “love drug” and one of the top ten aphrodisiac foods, is definitely an excellent choice when celebrating this holiday. The feeling eating chocolate produces is the same you feel as when falling in love so … let’s eat more chocolate!!! In fact, several compounds present in chocolate have been linked to one’s mood and pleasure, such as phenyl-ethylamine which has amphetamine-like stimulating properties and tryptophan, related to serotonin, a substance associated with ecstasy and happiness. In addition to its “love effects”, dark chocolate – rich in antioxidants – provides other beneficial properties such as reducing your levels of free radicals, which are responsible for cellular damage, aging and cancer. This delicious food is obtained from the tropical tree Theobroma Cacao, which has been cultivated in central and south America for at least three millennia. The Aztecs thought it gave strength and power to their warriors. In the past chocolate has been considered more medicinal, rather than the delicious treat it is today. In this recipe, the chocolate’s aroma blends well with the distinct flavor of Barolo Chinato, a Barolo wine flavored with a variety of herbs and spices, including quinine bark (china in Italian, pronounced KEY-na), and sweetened with a touch of sugar. As a dessert wine Barolo Chinato is a perfect match for rich sweets, especially those with chocolate like this superb cake. So when making the cake, save a glass (better yet, save 2!) to enjoy with your cake. And now, food meets art! Chocolate is not only a delicious treat; some artists use it as an expressive material in their work. If you like video performances please take a look at my dear friend and great artist, Ciriaca Erre’s video “Can I have another question?” A passionate and emotional modern Medea. Enjoy it!!! 13. In a medium bowl combine cream and powdered sugar, and beat with an electric mixer until soft peaks form. 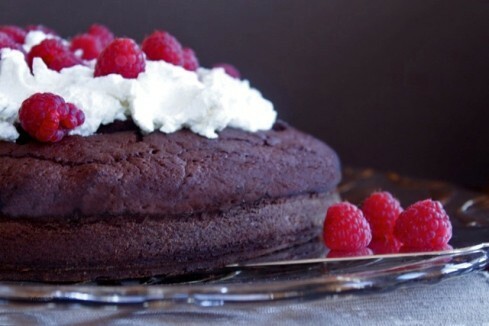 Decorate the cake with whipped cream and raspberries. The cake is beautiful, and I love that you have used Barolo Chinato, one of my favorites.. YUM! And bravissima! Thanks Adri! When I wrote the recipe I thought of you and your FAB post about Barolo Chinato! It is perfect with chocolate. Love it!